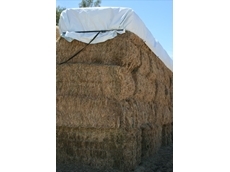 Ratch-e-tarp is the new innovation in hay covering from Polytex . 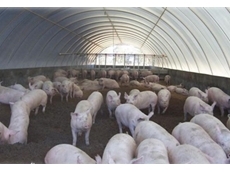 The Ratch-e-tarp has been specifically designed with hay producers in mind, proving to be an effective time saver for the last cotton harvest. 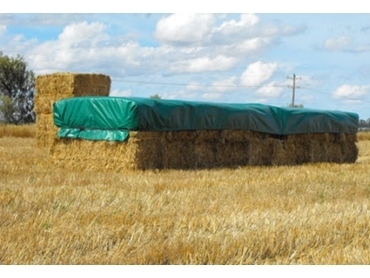 These specialist tarpaulins are fitted securely to a stacks of hay bales with the use of webbing ratchets. 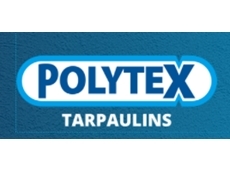 When used to cover a 40 foot stack the tarpaulins only require centre tie downs to be fully fastened against the wind. The Ratch-e-tarp is more secure than tarps that use eyelets. 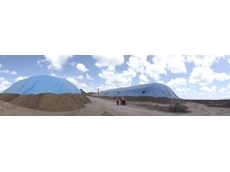 Ratch-e-tarp doesn’t rely on eyelets for securing down as Polytex maintains that they don’t provide sufficient security against continuous wind. 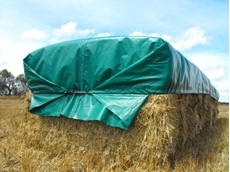 These Ratch-e-tarp hay tarps are designed with centre tie downs to prevent ropes and tarps from coming loose, ultimately protecting against tarp wind flap damage. 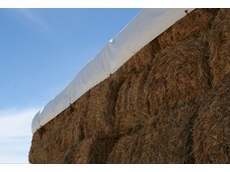 Tarps should always be kept tight to prevent damage and protect the hay. 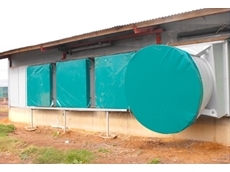 Polytex recommends that customers always be prepared for the rain and prides its team on its prompt service of supplying covers quickly when they are required, especially when rain is predicted.